The Loan Signing System Six Figure Course is an online video training course that contains the exact steps I have used to build my own seven-figure (not six but seven-figure) loan signing business. To make six figures as a loan signing agent, you simply need to average 13 loan signings that pay $150 each per week. 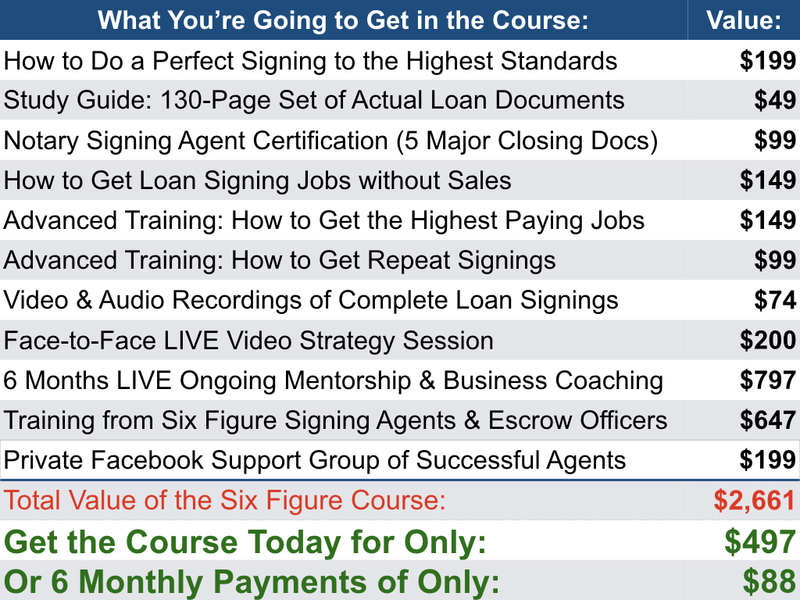 Unlike other courses, the Six Figure Signing Agent Course is not based on theory. I’ll show you the exact steps and specific directions in my training videos to help you become a six-figure notary public loan signing agent. Thousands of people learn from my videos, read my articles, and follow the Loan Signing System to become successful loan signing agent every day. The Loan Signing System is the number-one rated signing agent course in America because of my active participation in the best conferences and associations in the industry so you can learn the most up to date information. 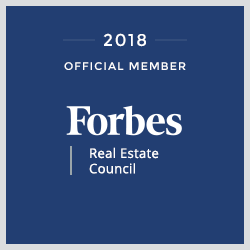 As a published Forbes Real Estate Council member, access to a vast network of leaders in the real estate industry is available to benefit my students! The first step to making six figures is ensuring that you are the #1 signing agent in every escrow office. Whether you’ve done 10 loan signings or 10,000, you’ll need to be sure your loan signing process is fully optimized to escrow standards (not signing service standards) which is what the Loan Signing System Training and Certification is designed to do. The Six Figure Signing Agent Course will teach you how to market yourself directly to escrow officers, real estate agents, and mortgage officers so you can make more money per appointment so you can stop splitting your fee with signing services. You cannot be a six figure signing agent if you don't know how to bypass signing services. Not only do I give you the exact marketing techniques I use to build my seven-figure signing agent business, I include a one-on-one marketing strategy session with me after you complete the course. The Loan Signing System is the ONLY course that teaches you how to “package” loan documents. Packaging loan documents is the best-kept secret to obtaining loan signings directly from escrow officers (if you don't know what ‘packaging’ is, that is why you aren't a six-figure signing agent). The most integral part of the Six Figure Signing Agent Course is getting 180 days of ongoing mentorship directly with me, LIVE! The mentoring will include ongoing sales training, business coaching and marketing mastermind sessions with me! Get exclusive training directly from escrow officers, loan officers, and real estate agents... the very people that hire you for loan signings. Meet other successful signing agents from coast to coast! Get the Course Today and Save Over $2,100! If you don't like the course for any reason, simply let me know for a full refund. 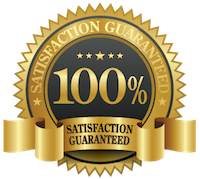 As soon as you purchase the course, you'll get unlimited and immediate access to the five-star rated course and certification! If you really want to be successful as a signing agent this course is the only course you need. Mark takes you step by step in developing you into the best signing agent you can be. Not only does he teach you the basics, he also gives you real world examples and demonstrations on how it works. Don't waste your money on programs that are inadequate. If you want the bang for your buck this is the only course you need. This course equipped me with the tools I need to take the industry by storm! Big thanks to Mark, who answered questions that I had in a timely manner! Take the Six Figure Course and you won't regret it! Intro: What is a Loan Signing Agent? Mortgage Professional Scripts to Get Signings! Section V: Training from Mortgage Professionals and Successful Signing Agents! Which Certification Should You Take First: NNA or Loan Signing System? Do You Need the NNA Certification? Does the Loan Signing System Work in Different States? Get the Advanced Training Conference Series Today!